SatiSupp is a Valued Empowery Supplier. Click here to learn how SatiSupp can help your Business! Escaping the 9 to 5 lifestyle to live a life of freedom is a straightforward process that anybody can follow regardless of their background. How Achilleas escaped the cubicle lifestyle and recognized opportunities in his home country. Why customer support is not the only big thing in business. How you can make the most out of your entrepreneurial journey in Amazon. So put on your headphones and let’s get to know Achilleas and his Awesomer journey. Steve: Welcome to the Awesomers.com podcast. If you love to learn and if you're motivated to expand your mind and heck if you desire to break through those traditional paradigms and find your own version of success, you are in the right place. Awesome around the world are on a journey to improve their lives and the lives of those around them. We believe in paying it forward and we fundamentally try to live up to the Great Zig Ziglar quote where he said, you can have everything in your life you want. If you'll help enough other people get what they want. It doesn't matter where you came from. It only matters where you're going. My name is Steve Simonson said that I hope you will join me on this awesomer journey. If you're launching a new product manufactured in China. You will need professional, high resolution, Amazon ready photographs because Symoglobal has a team of professionals in China, you will oftentimes receive your listings photographs before your product even leaves the country. This streamlined process will save you the time, money, and energy needed to concentrate on marketing and other creative content strategies. Before your item is in stock and ready for sale, visit Symoglobal.com to learn more because the pictures should be worth 1000 keywords. You're listening to the Awesomers podcast. Steve: You are listening to episode number 93 of the Awesomers.com podcast, and the secret is out. To find out about today's show note and details, links, things like that that we discussed. All you have to do is go to Awesomers.com/93. To see all those fun show notes, details, there's even a summary and even a full transcript that helps you get through today's episode. So get on over there and check that out. Now, today is part one of a three part series with my good Buddy Achilleas Daskalakis . And I hope I said that right. Achilleas is a brilliant young entrepreneur and somebody that I find to be both delightful and also brilliant. And so today's episode we kind of get into some of his origin story and I'll just share some of the highlights of that origin story from my perspective. Steve: So, you know, starting out as a young person, he was on the track to kind of fall into that same safe nine to five stable environment that his dad got him on the track for it. You'll hear a little bit about how that track got started in today's episode. Once that track was set, though, it was not long after that, that Achilleas really figured out, maybe I'm not a cubicle guy, maybe I'm not a nine to five guy and he partnered up with a good young, strong person, also a great entrepreneur, Konstantin. And they decided to try something and to go ahead and break it out of the comfort zone to give it a go. And by the way, their first effort at it was not perfect. It didn't quite work out the way they thought. Even though you'll hear Achilleas talked about this, that they were willing to try to give away the service for free to test the concept of first. So a really inspiring origin story coming all the way from Greece today. And Achilleas is a great person to learn from a great person to listen to you. And even the services that we've talked about that, that his companies provide, we'll get those links in the show notes for you, but those can be very effective for anybody trying to move into the United States. We'll talk more about that at the end of this episode. Let's get into it right now. Steve: Hey, awesomers. Guess what? It's me. Steve Simonson, and we're back again. And today I've got my good friend Achilleas whose last name I'm not even going to attempt to pronounce. Achilleas helped me with it, please. Okay. So it's Daskalakis. Daskalakis. That was my guess. I have a, uh, I have a long history of mispronouncing names and I'm like, it's all Greek to me here. So thank you for joining me. I appreciate you taking the time out and I've already read in the BIO for the audience listening. And so they kind of have a little bit of the high level background, but tell us where you live today and what takes up your time day to day as well . Achilleas: Alright so you said its all to you. That's because I'm Greek. Yes. Yeah. Not too difficult to understand because of my name, you know, my first name, Achilleas. So yes. Today I live in Greece, I spent some time mostly Cypress for obvious reasons. Yeah. It's obvious reasons because I'm assuming it's the nice weather and the beaches. Is that, am I right? Exactly. Exactly. These are some tax reasons, but now we're getting somewhere. Yeah, yeah, yeah. Don't talk about this anymore. You know, maybe the government is listening, but I'm not doing anything illegal. Achilleas: They have glad you get the emphasis on nothing illegal. Yeah. So yes. Uh, so most of my day, not most like 99 percent of my day. I'm not feeling so good about it, but yes, it's Amazon in a way. It's business. I have the same. Not only Amazon. One thing I learned from you is that not to focus only Amazon, but to focus business. It's smarter is better and it becomes in a way the opportunities becoming higher if you focused like that. So what I'm doing for the past three and a half, four years, let's say I have a service business which paid for Amazon sellers, uh, when it comes to their European expansion and uh, doing lots of stuff like I dunno, a translations giveaway, so account management, anything that everybody would need to go to the EU markets and some also for the US market and after, you know, I'm doing this for four years in the past two years because I want to check and test a lot of my stuff. Achilleas: I also started some brands just to check, just to test and the end of the day I saw that I make a lot more money when I'm testing rather than, you know, providing services for me, it's way easier to do it because you know, so now we're like an in total we have six people in house here in Greece and we have some people, you know all over the place because we have to do some translation, some customer support in native Spanish, Italy, Italian friends and stuff. So it's way easier for me to monitor product business that actually to go and talk to every single person, but thank God we have people for that I have great people to work together with. And this is like the best thing you can have. I don't know who said that. I think Steve Jobs said that always hire smarter people than you. Steve: Oh yeah. It's a good advice. And so I really liked this and just to kind of reframe this, you know, the concept is you started out kind of a service provider and being able to say to people, Hey, if you're trying to get into the EU, I can help you. And by the way, for the audience lists out there, we'll make sure we get the links in the show notes and so forth to make sure you connect with Achilleas companies, but to be able to help somebody and say, you know, you have this problem, you want to take your product. And it's mostly an Amazon centric idea, but it really applies to any marketplace or any platform and Amazon or any platform on online to say, I've got this product, it's basically in English. I've been selling it in the US and now I want to sell it in the UK. Steve: That's easy enough. I don't know. Not much help really required there. There is some tweaking that is needed, but you know, when you start talking about German and French and Italian and Spanish, you know, to, to get these other main marketplaces, you got a real thing going on and all the customer service that goes into that with the native language and so on. All of that is a big challenge and it's terrifying to guys, you know, in North America or Asia or wherever that don't have European experience. So how did you identify that as an opportunity? I'm curious. Achilleas: So let me get a step back for that. Sure. All these started when I'm not an owner of the company, so I'm a co-founder of the company. The other co-founder, you know him, it's Konstantin. Yeah. So back in 2014, we studied the masters, uh, in the Netherlands. So we're staying at the same place, having fun because I think you've been in Amsterdam and stuff. Steve: Don't drag me down this road. Achilleas yes, I have been in Amsterdam. I didn't do anything illegal! Ok, me neither then. Well in Amsterdam most everything is legal, so it's okay. So you said you were better at a mastermind. Did I hear that right? No, no, no, we're doing our masters there. Oh, your master's degree. Okay. Yeah. So I was studying strategy and innovation. He was standing in international business. So the thing is there that Konstantin is a guy that always thinks of new stuff. He wants to do something more, he wants to make more money and stuff. So the thing is that I'm the type of guy that I'm a lot jealous, very jealous. So we were thinking about our house there. We had a very nice house in Huronagane and is not Amsterdam its like in the north. Achilleas: So I saw him every night. He was in his mark typing some stuff and then all of a sudden he started making some money and I saw him no buying new stuff. I was like, how? I mean, you know, we have certain budget. We discussed our budget for the month. He said like, I'm, I'm doing some customer support for a guy. It's like very easy. So it cost us because something is half German. So he lived the first 40 years of his life in Germany and he's already German. That's a very good thing to have in business in general. So here in Greece someone that knows as a matter if that's the right word, German he has higher opportunities and he gets paid a lot. So his background, he was doing customer support for the Apple, iTunes and stuff. So he was actually, um, how you call these guys, let's say your manager in a way, let's call him like that. Achilleas: So the thing behind that is that he knew how to do customer support. So he went to Upwork. I'm sure you know Upwork. Sure. He just found a guy in need of a customer support for this. Okay. He applied. He was answering around two emails per day and he was making $200 bucks a month, so 200 bucks a student in the Netherlands, you can have a lot of beers. Or anything else. Anyway, so also jealous of that and I'm like, Oh man, I don't know how to speak German. So okay. After sometime I'm like, yeah, maybe let's think of something smarter. I don't have to learn how to speak German. That's stupid. I know how to speak English well. Great. Then I understood that everybody in the world knows how to speak English. It's not that difficult. That's lucky for me. That's my life easier. Achilleas: Yeah, that's true. So you know, I went to work on Upwork. I started, you know, with the beat on myself, like, I don't know, $10 an hour. Nobody was interested. $7 an hour, nobody interested. $5 an hour. Nobody interested in hiring me because they didn't have enough experience in the end that was offering for free what I'm doing, and nobody. Nobody wanted me. And I'm like, oh, come on man. He's like, free. OK, It's a Greek bearded guy. Okay. But it's free and come out and I was wearing it on my tie. It was very good. So I said, Ok leave that it's not going to happen because something was not going to happen. Okay. So after some time constantly, it comes back to me a very strange night, you know, after some alcohol outside. And he says we will hire a lot of people. Achilleas: They're going to be Germans, they're going to be Italians friends and we are going to be a huge customer support. Things like the Teleperformance. I don't know if you know this company, what's it called? Teleperformance. Teleperformance no, I don't know. HBB Company. They are, you know, in Europe and stuff, not doing customer support for companies. So I'm like Oh yes, that's the best thing. We can do the best thing we can do. So we wanted to start, you know, when the company started hiring, some people do the customer support. Thank God, the guy back then found us or on Upwork and showed us what actually Amazon is. So that guy came back to us and said, so I want you to find 200 Germans, give them away one product for free and you're going to get paid. How much was that? 800 euros or something. Right? So like, yeah. So for us that was a fortunate. So we were saying to each other, oh my God, these don't take this wrong, but we're saying these stupid American. So he gave us so much money. Yeah, fun fact after two months or something, we had access to his accounts and we saw that out of this, you made 150k. Achilleas: I think you he wasn't stupid, I think that now. So. So then this idea came to us, came to light that it's not only about customer support, you have to pivot every time, you have to see what's happening. So we saw that giveaways, it's something. So we've been the giveaway website after a lot of difficulties and a lot of females. I answered myself, I don't know, more than 10, 15,000 emails by hand until we make the actual website to do the giveaways in a way that it's still on a bill today and it's very good in any way, but the thing is that we understood that Amazon is a very - I'm not going to say it's a very easy way to make money because I saw you also replied to a comment to someone. It's not easy to make money on Amazon, but it's, it's very easy to start doing it. Achilleas: So if you want to live a life like an entrepreneur or anything because I like this. I like having my office in a way and tomorrow can be in my knowing my country house and do the same thing I'm doing here. If you want to do this, Amazon is something great for me for someone else. Maybe some against. I don't even know. I don't, I don't care the end of the day, but the thing is that when you supervise a whole market, especially the EU market back then, so four years ago I had like, I don't know, 20, 30 people, a good friend of mine introduced me were huge Amazon sellers in a mastermind. Not like a huge mastermind. So I was asking these guys, so guys, let me get you to EU. Uh, no, we don't care about that. Come on, the Greek is starting to talk about the EU. We don't care about that. Let's have fun. I'm like, guys, Germany is going to be big. It's gonna be huge, blah, blah. Everybody was like, ah, I'm not interested. I'm not interested. Only two of these guys came. The thing is that last year or the year before all these guys contacted me asking to go to Germany and to help them to go to Germany. Germany is the second biggest market of Amazon. That's huge. Steve: It is. It's amazing that people don't fully comprehend the difference in between the countries and it's, it's, it's amazing to me because I am aware of it, I know about it and as you said, you know, uh, I routinely use this quote that I say it's simple but it's not easy, right? It's, it's relatively simple to understand the concepts and put the pieces together, but that doesn't mean it's easy to execute it. And so, you know, and I'll be honest, that you know, in, in whatever your native tongue is, that's always going to be the most simple and the easiest versus going into some other language because this idea that just translating a product description or the product title or the bullet points or whatever, and then you're done. It's like, no, that's not, you're not done. That's just the beginning because when you get a sale and you have an issue with the customer, you need to give them native language support. Otherwise they, you know, if you just try to use google translate Gimme a break, it's just amateur hour. So there's so much there and I, I appreciate you sharing kind of the, the origin story of how you and Konstantin got together. We're going to take a quick break. When we come back, we're going to dive into your personal origin story and what makes you tick. We're going to do that right after this break. Steve: I've got another awesomer review hero to share with you today. This one is another five star review found on iTunes and it leads with the title five stars, which I think is short and to the point. I appreciate that and it's from Maddy. Now I do want to say that I have a daughter named Maddy, but I checked with her to see if she left this review. She said she did not leave this review. So A, I don't think I have any conflict of interest. I don't know who Maddy is but B, The idea that my own daughter would listen to my podcast is idiotic to begin with. So you should immediately stop listening because I know nothing, but in this case, another person named Maddy left this review. "Really great content, full of Info and ideas that can help you navigate through the world of business. Definitely recommend giving the first episode, a listen!" And I thank you, Maddy. You are certainly my awesomer review hero and I would say that if you, anyone listening goes and listens to the Awesomers.com/1, the very first episode founded Awesomes.com/1. And what I say in that long episode about our mission, our vision, and our values. If that resonates with you, you definitely want subscribe and listen and carry on, and if you don't like it, that's okay too. I get it. It's not everybody, but I say, if you like it, then let's share it and let's go leave a review and heck, you could even join our online community at the facebook page. Awesomers.com, and our group. Awesomers.com. Amazon professional sellers group. The Amazon marketplace professionals. This is Parsimony ERP. Can we get one question over and over? Can you please tell me exactly what Parsimony does? Well, we'll try, but this is only a 30 second spot, so we're going to have to hurry - connect to your seller central account and pull all the new orders, enter the orders with all customer data and are all of the Amazon fees and charges. Score them at the item level, generate profit and loss reports at the Sku level, automatically generate income status, handle multiple companies and multiple brands. Handle multiple currencies, facilitate budgets and forecasts, so all customer interactions in a sophisticated CRM system manage your selection, maintain a monologue. Hey, you get it. That's Parsimony p a r s i m o n y.com or Parsimony.com. You've got that. You're listening to the Awesomers podcast. Steve: Well, there is so much to unpack in these origin stories and you know, first of all, I want to thank you for joining us. It's a real honor to be able to have you invest your time and energy to take a listen and I hope you enjoy this part, one of a three part series with a Achilleas because there's so much more to be said that the next interview, part two will come out tomorrow. You won't want to miss it. Make sure that you've already subscribed to the podcast so you get the automatic update and you get that happy little feeling when you see podcasts alert. Awesomers.com has another podcast ready for you. This has been episode number 93 in our series from Awesomers.com and just go on over to Awesomers.com/93 to see all the show notes and details. 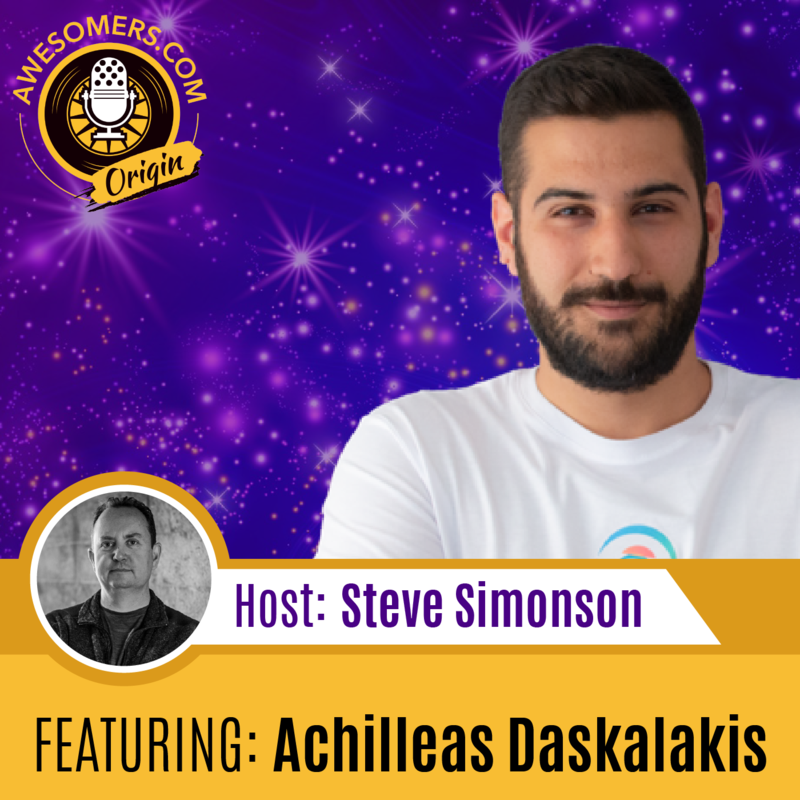 Steve: My final word today is really about Achilleas curiosity, his natural brilliance and his willingness to take risks and you heard about some of that in today's episode. We're going to hear more of that in parts two and three, but these are common characteristics of entrepreneurs and I want people to pay close attention that, you know, even even though I think entrepreneurs in general are more risk tolerant, that doesn't mean we like risk, doesn't mean we're comfortable with it. It just means that we're willing to take that plunge off the cliff and figuring out how to build the airplane before we hit rock bottom. Literally rock bottom right. And so, um, I suppose it would be figuratively rock bottom in my, my metaphor, the point is just because that we all can acknowledge entrepreneurs are generally more risk friendly, doesn't mean we like it. And yet these guys Achilleas and his partner Konstantin at a very young age, we're able to embrace risk to take these risks and think that tells a lot about, you know, who they are and gives you a great example of you could be as well. Steve: Thank you for listening today and please don't forget to get out there and share and subscribe, and why not leave a five star review. I literally read those as often as I get them and they make my day everyday, so if you want to make my day, this would be a good way to do it. Thank you. Well, we've done it again, everybody. 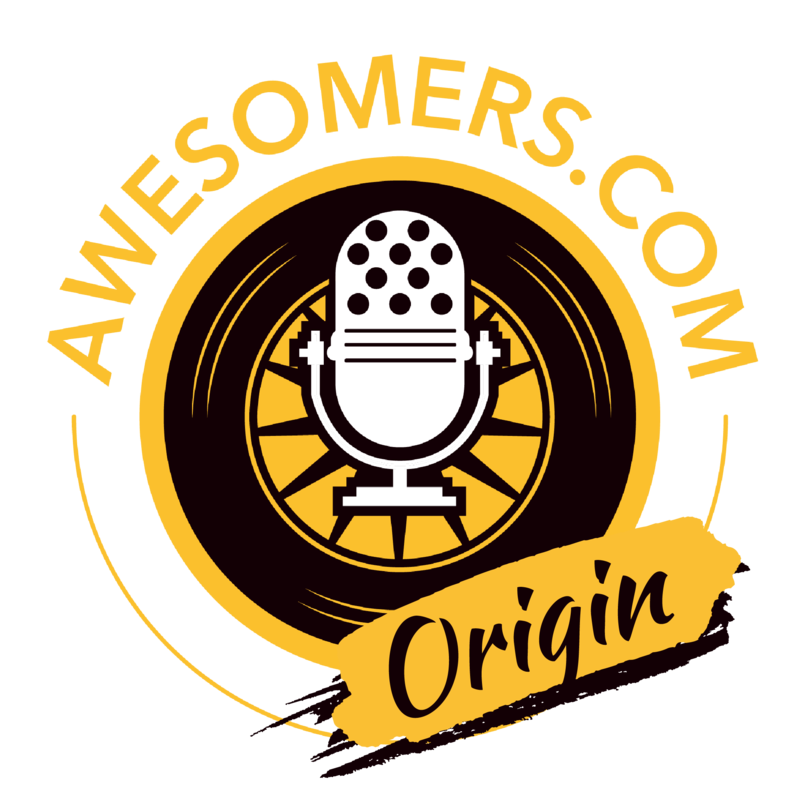 We have another episode of the Awesomers podcasts ready for the world. Thank you for joining us and we hope that you've enjoyed our program today. Now's a good time to take a moment to subscribe, like, and share this podcast. Heck, you could even leave a review if you want it Awesomers around you will appreciate your help. It's only with your participation and sharing that we'll be able to achieve our goals. Our success is literally in your hands. Thank you again for joining us. We are at your service. Find out more about me. Steve Simonson said our guest team and all the other awesomers involved at Awesomers.com. Thank you again.